As a young child when people tell you something you most likely will believe them. I work with kids and adults. My kids rang in age from as young as 2 all the way through high school. I learn a lot from watching my little ones. The really young ones I teach in a group setting. The older ones tend to be one on one. I can’t tell you when exactly, but somewhere between 1st and 2nd grade is when children stop trusting and believing so easily. If I tell my 3-4 year old girls that they look pretty, they almost always reply with a big smile and thank you, some even say…”I know”. They don’t doubt that what I am telling them I mean. There is no flicker of…”she is just saying this to be nice”, or “She is saying this so that we will be well behaved and listen”. They take my words at face value, as they should, because I woudn’t tell them that if I didn’t mean it. I have no ulterior motives, I mean what I say and say what I mean. I try and live my life by that mantra. There are enough lies in this world and I don’t want to add to the pollution that already exists. I stupidly believed that most people are like me. Why would you compliment somebody, lie about how you feel, or make plans, if you don’t mean it. I get the whole white lie thing, but I am not talking about white lies. Instead, I am talking about the kind of lies that crush and devastate you. The funny thing about the truth is that it always comes out. So why try and hide it? I am learning the hard way that most people constantly lie. “Good” people lie, the ones that seem so pure lie, and I am frustrated by this fact. Not only am I dealing with this problem, but many of my close friends are too. It’s heart breaking to believe a lie, it not only makes you question yourself, but also humanity. So learn to hold your damn tongue. Don’t say things you don’t mean. Don’t make promises you can’t keep. 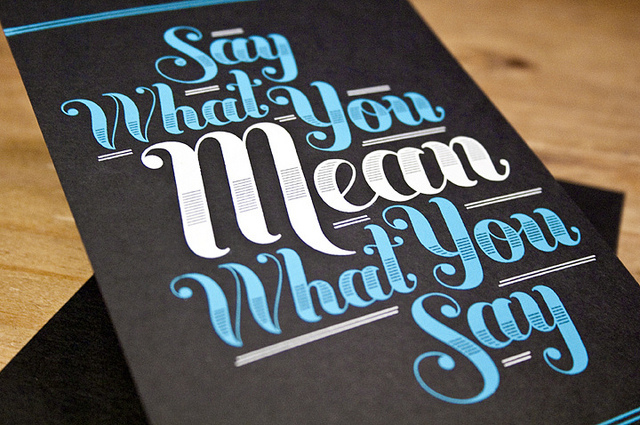 Mean what you say and say what you mean. Life would be a lot less painful if we could all just learn that lesson and stick to it.